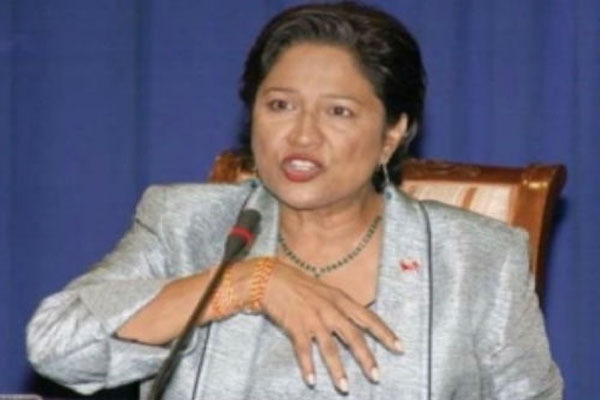 PORT OF SPAIN-Trinidad (CMC) – Less than a week after she dismissed her Minister of the Peoples and Social Development Minister Glen Ramadharsingh, Prime Minister Kamla Persad Bissessar is being asked to dismiss yet another of her ministers. While she has so far remained silent on the issue, calls have come from the Congress of the People (COP) party, the second biggest partner in the coalition People’s Partnership government for Tourism Minister Chandresh Sharma to either resign or be fired over allegations that he assaulted a woman at a car park. COP Leader Prakash Ramadhar, who is also the Legal Affairs Minister, said that the party hopes the media reports about the incident involving the minister are untrue. “Notwithstanding that, the COP has been consistent in its position that where serious allegations are made against senior public officials, as in the case of former Minister Jack Warner, such persons should remove themselves from office until the allegations are properly investigated and resolved. Alternatively, they should be removed from office. “Consequently, the COP calls on Minister Sharma to tender his resignation from the Cabinet until his name is cleared. In the absence of the Minister’s resignation, the COP expects that the Prime Minister, Honourable Kamla Persad-Bissessar, will move with alacrity, as she has done in the past, to preserve the integrity of her administration and of the institutions of State,” Ramadhar said in a brief statement. Media reports said that Sharma, 54, had assaulted the 30 year-old managing director of a security firm, Sacha Singh with whom he reportedly hard a relationship. Acting Police Commissioner Stephen Williams confirmed that an investigation into the matter had been launched after the woman reported the March 12 incident to the police. She claimed that she was “knocked out after being pushed” by Sharma during an argument involving her and two other people. Singh, who appeared on television on Sunday night said that Sharma should publicly apologise “for his outright assault against me”. Singh alleged that she confronted Sharma with a woman with whom he allegedly had an affair and a 12-year-old child from that relationship whom he refused to maintain and when she did this, he became violent. Secretary General of the Sanatan Dharma Maha Sabha (SDMS) Sat Maharaj who had publicly called for Ramadharsingh’s resignation or dismissal last week, has termed Sharma’s case as one fo a domestic nature, saying domestic issues have existed in politics for a very long time. “Politicians and their extra marital affairs and matters like these they sit on their own,” said Maharaj, noting that Ramadharsingh had put a number of people at risk on the flight by his behaviour but Sharma’s issue was between him and his alleged lover. “The matter should take its course, we are talking about chalk and cheese. Chandresh is about twice the age of that woman, she must have known what she was getting into, I leave that for the court and the police to investigate,” said Maharaj, the leader of the largest Hindu group here. Sharma is a senior official of the Hindu religion here.